Although eggs offer a number of nutrients, eating too many can cause problems for your diet. Whole eggs contain saturated fat and cholesterol, too much of which can increase your risk of heart disease. Eggs are an inexpensive source of protein, but make sure to include eggs in moderation. One whole large egg contains 186 milligrams of cholesterol. The American Heart Association recommends limiting cholesterol to 300 milligrams per day. If you consume an ounce of cheddar cheese, a cup of whole milk and four slices of bacon with one egg, you have hit your cholesterol intake limit for the day. Consuming too much cholesterol can raise your blood cholesterol levels, increasing your risk for coronary artery disease. If your LDL cholesterol – the bad kind – is high or you are already diagnosed with heart disease, you should limit your daily cholesterol intake to 200 milligrams per day. One egg will take up almost all of your daily limit. One whole egg has 5 grams of fat, 2 grams of which are saturated. Consume a three-egg omelet made with 1 ounce of cheddar cheese and you get a total of 12 grams of saturated fat. The American Heart Association recommends limiting your total saturated fat to less than 7 percent of total calories – for a 2,000-calorie diet, this is 15.5 grams daily. Eating too many eggs can cause you to over consume saturated fat, again increasing your risk of heart disease. You can avoid all the cholesterol and fat in eggs by sticking to just egg whites. The egg whites, however, contain very little nutrition. One whole egg white has 3 grams of protein, but lacks the lutein, most of the B vitamins, vitamin A, selenium, phosphorus and iron that contribute to the nutritional value of whole eggs. An egg once a day, a few times per week is acceptable for most healthy people. When you do eat eggs, limit your intake of other foods high in fat and cholesterol including sausage, butter and bacon. 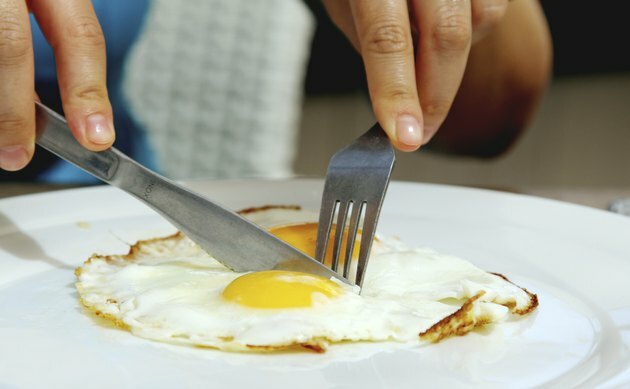 The Harvard School of Public Health notes that for people suffering from diabetes and heart disease, keeping egg yolk consumption to three or fewer per week can help your health. If you need to limit your egg consumption but miss the taste of egg yolks, try combing a whole egg with egg whites in your recipes -- an omelet made with one whole egg and 3 egg yolks, for instance, is lower in cholesterol than an omelet made with 2 whole eggs, but offers more flavor than the plain egg white version.